I begin this new year with an ancient recipe, ‘cause I need some history, I need stuff which survived the times and requires time, roots to grasp to face this word getting increasingly smaller and faster. 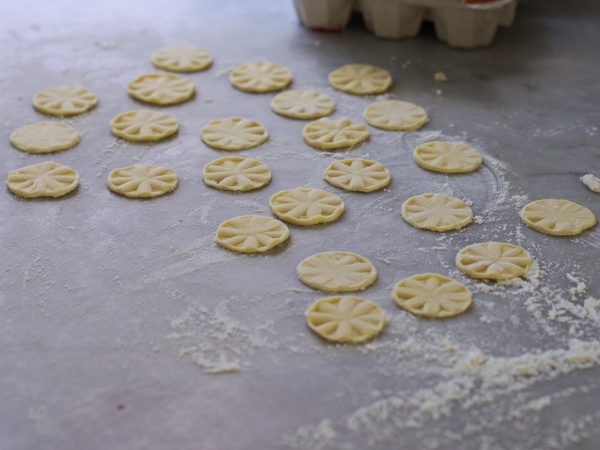 I start this year preparing some corzetti (or croxetti), a kind of pasta which is part of the Genoese and Liguria tradition since the medieval ages. Maybe not many people know that Genoa and the Italian Riviera for many centuries excelled in the royal art of pasta.The first proofs of the presence of pasta on the Genoese kitchens back to the eleventh century. This should not surprise: Genoese people were very powerful merchants (Genoa was one of the so called Mariner Republics jointly with Venice, Pisa and Amalfi) and traded wheat all over the Mediterranean sea.Powerful but also cunning and ruthless: they hoarded huge quantities of wheat in the good seasons, stocked them in the city port stocks (the first one in the history, by the way) and resell it all over Europe and north Africa during famine periods at very high prices. In Genoa therefore – even if there was no farmland around – wheat was never missing. Add to this the frequent contact with the Arab countries – where the art of pasts is said to be born – and the favorable weather conditions (sun and wind) to dry pasta. So this is why Genoa, and then Liguria, developed one of the most ancient Italian pasta traditions. 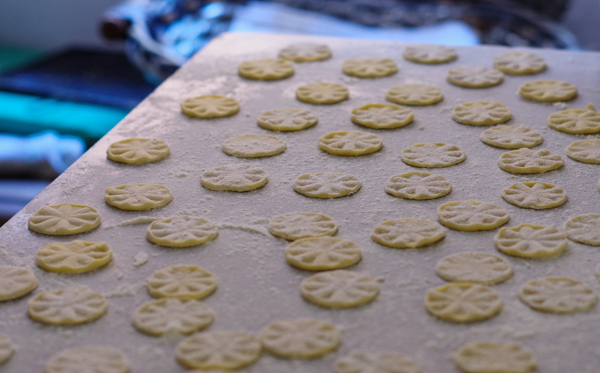 Among the oldest kind of pasta there are Corzetti (or Croxetti), small circles of pasta with a flowery decoration stamped on it. It is said that originally the stamp was done by pressing a coin on the pasta. Only afterwards this edible art developed and the pasta makers started to use elaborate wood stamps especially done for embossing any kind of design or noble family coat arm. Today you can find Italian corzetti already prepared and packed in regional food shops or in few typical restaurants. 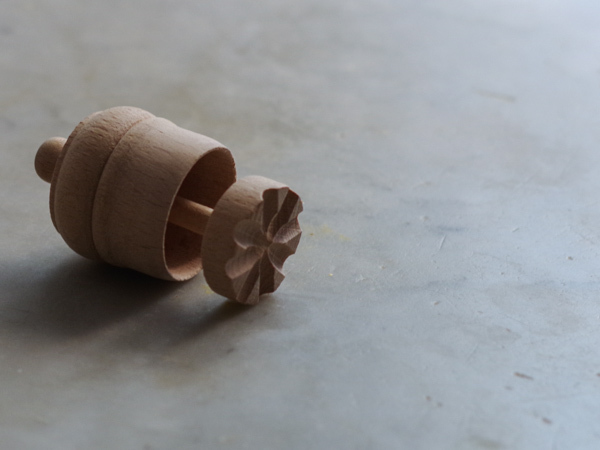 Making them at home is quite unusual, it takes time and finding corzetti stamps is not that easy. 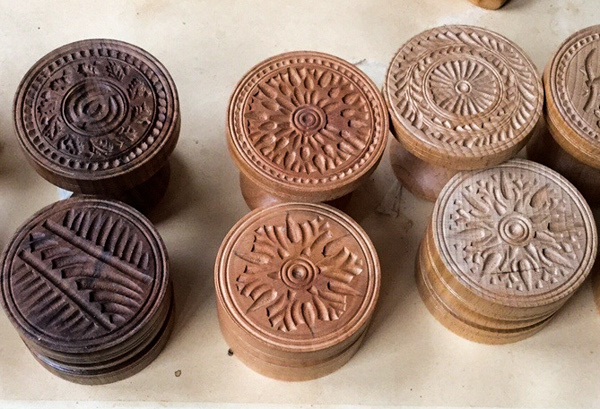 However, there are still few artisan woodcarvers, especially in the East Italian Riviera, who work to preserve this ancient culinary art and carves gorgeous garnishing stamps just like centuries ago.Among these Pietro Picetti – who in his small shop in Varese Ligure carves scented piece of woods (from apple, pear or marple woods) – and Maestro Franco Casoni, a famous master woodcarver with lab in Chiavari (Via Bighetti) who hand makes corzetti stamp from beech. As far as I’m concerned, waiting for a planned trip to Varese Ligure and Chiavari to discover and tell the story of these local artisans, I bought a corzetti stamp at Mastro Geppetto, a small wood shop in Cervo Ligure (the place where my ancestors born and which is officially one of the most beautiful village of Italy, by the way…). The stamp is not really a traditional one and the garnishment is not so elaborate but I really enjoyed preparing a plate of simple and happy daisies. 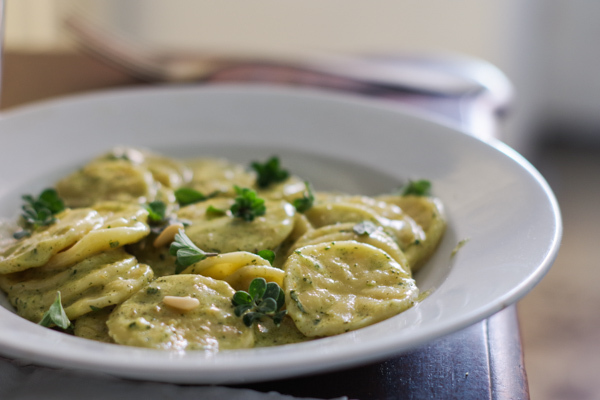 The perfect sauce for your corzetti, after a long work, is a quick, easy and light pesto made with marjoram, pine nuts, walnuts and parmesan cheese to prepare at the very last minute when the corzetti are boiling in the water. Put the flour on the working surface and make a hole in the middle like a volcano. Open the egg in the centre of the crater and beat slightly with a fork, add the white wine and water, a pinch of salt and start mixing the liquids. Then star adding flour to the mix gently digging the side of the crater with the fork. Little by little the dough will harden. When the dough starts “staying together” dig your hands and start kneading it, blending and pressing with the lower part of your palm for many times. If it remains too dry and in flakes add a small quantity of water just wetting your palms. Repeat if needed until you get a dough soft and elastic. You can check if its elastic enough putting a finger in the dough: if the dough returns in its previous shape and the hole disappears it’s ready. 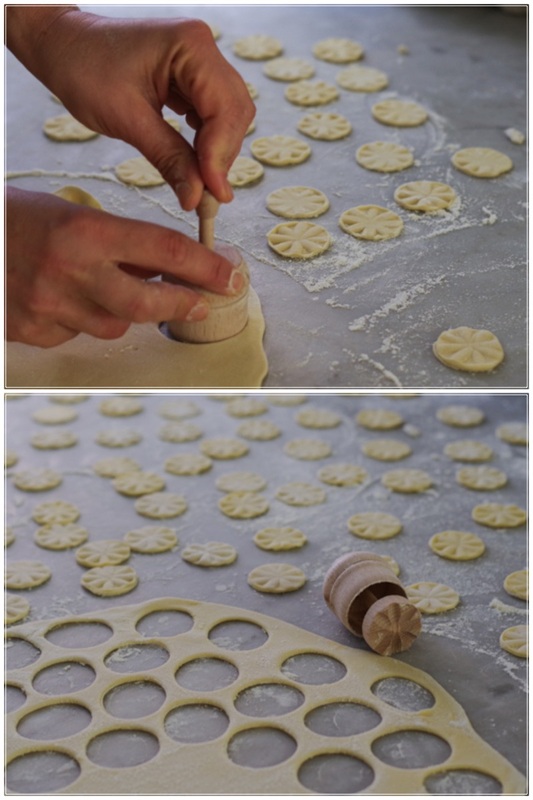 On a surface well dusted roll the dough in a thin sheet with the help of a pasta machine (I have the old Imperia pasta machine of my granny) or with a rolling pin and cut many small circles of ab. 5 in. diameter with the help of the apposite corzetti stamp or with the edge of a glass. On the side of each circle imprint the decoration either with the corzetti stamp or with an embossed coin or a medallion. Be careful to dust the dough and the stamp with some flour to avoid that the dough sticks to the stamp. 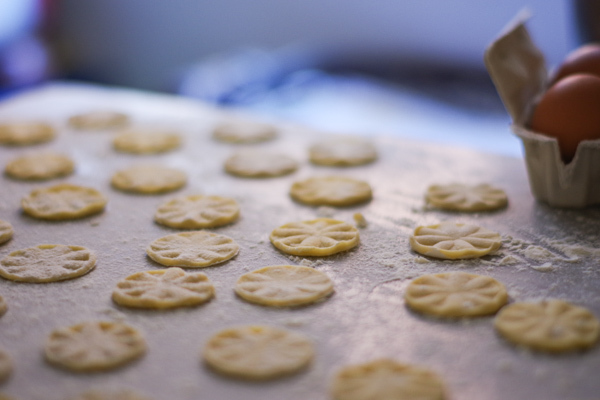 You can boil the corzetti immediately or leave them to air-drying and eat them after some hours. Blend in a mixer the pine nuts, the walnuts, the marjoram leaver and half of the olive oil until obtaining a thick and consistent paste. 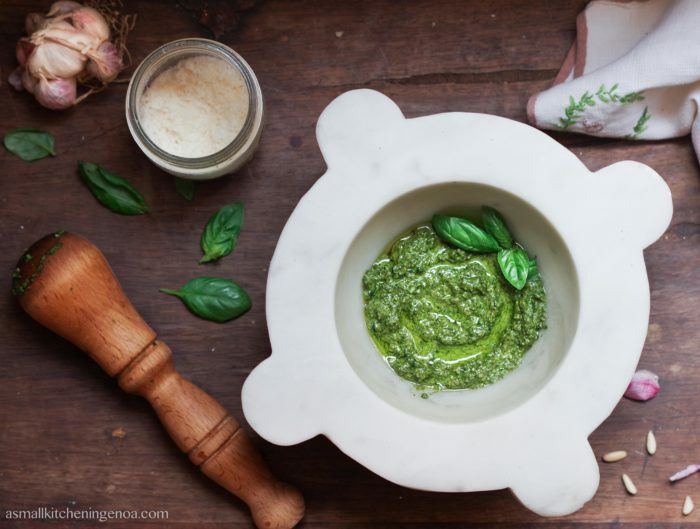 Put the pesto in a bowl and add the remaining half of olive oil and the parmesan cheese. Add salt to taste. Boil corzetti in a big pan of salty water for about 7-10 minutes (cooking time depends on the thickness of the pasta, taste before draining). Drain the corzetti and set aside ½ a cup of boiling water. Put the corzetti in a skillet jointly with the marjoram pesto and the ½ cup of boiling water. Stir gently and cook for a couple of minutes at low fire until the sauce is creamy. Before serving decorate with some leaf of marjoram, a fistful of pine nuts and a drizzle of olive oil. If you want to see Mr. Picetti at work with the Italian corzetti here is an interview on You Tube. 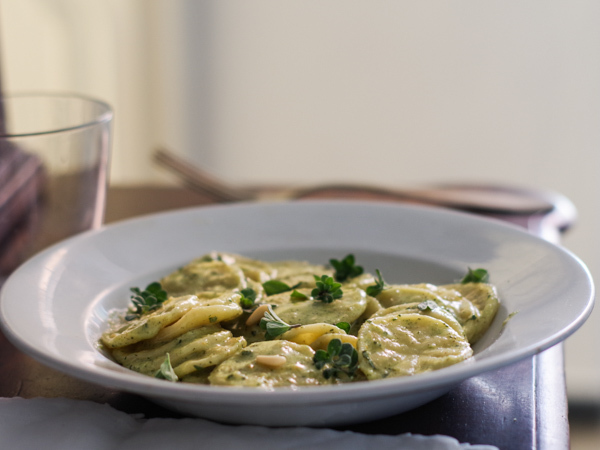 In the Italian Riviera we season corzetti also with the famous Genoa basil pesto sauce. 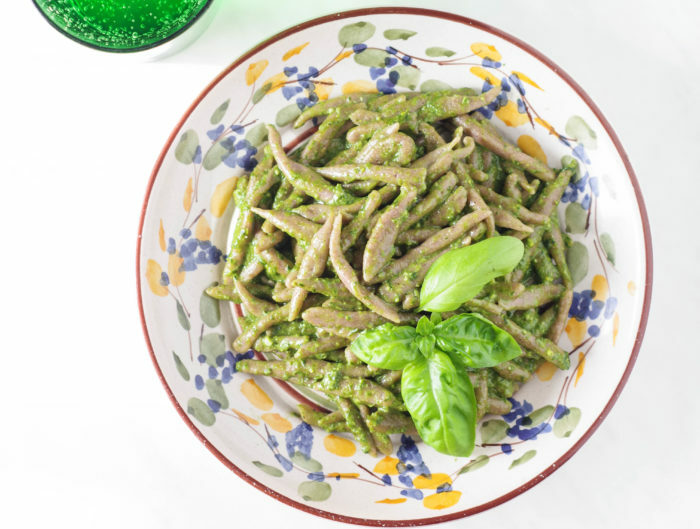 If you want to try the recipe here the link for my Complete Guide to Pesto Sauce. Or you can season them also with the famous Walnuts sauce, which is a fabulous, easy and tasty vegan sauce to season you pasta. How many will this recipe serve? Looks delicious! I have a bag of croxetti (1 lb) and want to make enough sauce. I have 10 people coming for dinner. How can I contact Pietro Pacetti or Franco Casoni to have a custom stamp made? Unfortunately a trip to Italy is not in the cards. unfortunately I do not have the details of Mr. Picetti. Franco Casoni details I found on Google are the following: MOBILE: + 39 329 400 38 96. E-MAIL: studio@francocasoni.it. Hope you can get in touch with them. Cheers and thank you for passing by! !